As the flood disaster takes its toll yet again, there are reports of USAID and ADB considering funding the $12 billion Diamer Bhasha Dam in Pakistan. The project is located on Indus River, about 200 miles upstream of the existing Tarbela Dam, 100 miles downstream from the Northern Area capital Gilgit in Gilgit-Baltistan region. The dam's reservoir would hold so much water that it could have averted last year's devastating floods. It would also provide enough electricity to end Pakistan's crippling shortages, according to a report in the Guardian newspaper. The massive dam on the Indus river would provide 4,500MW of renewable energy, making up for a shortfall causing up to 12 hours of load shedding on daily basis across Pakistan. The reservoir would be 50 miles long, holding 8.5 MAF (million acre feet) of water. In addition to large dams, there is also a need to build and maintain dykes and start other flood-control projects in flood-prone areas like Badin and Thatta in Sindh. The NY Times recently reported that "Washington’s fears of Pakistani corruption and incompetence has slowed disbursal of the money". The story reinforces the widely-held view that even after the funding is arranged, the corrupt and incompetent politicians and their hand-picked civilian administrators make any development progress slow and difficult. Such problems are further exacerbated by significant security issues in parts of the country severely plagued by ongoing militancy. Surprised to see no India bashing ... a welcome change indeed. Anon: "Surprised to see no India bashing ... a welcome change indeed." India is playing its traditional role as a "villain" by objecting to US funding of the much-needed Bhasha dam in Pakistan, something I should have mentioned. How the f--- will a dam in Gilgit control floods in Sindh when it is the rains in Sindh that are causing the f----- havoc? The goal has to be to build diversion channels in Sindh to areas where water could be stored. There are such locations in low-lying Thar and parts of Sindh Right Bank. But since that water will only be available to Sindh, Pakistan's Punjabi government and news media will never propose that. Neither, unfortunately, do you. Shams: "How the f--- will a dam in Gilgit control floods in Sindh when it is the rains in Sindh that are causing the f----- havoc? The goal has to be to build diversion channels in Sindh to areas where water could be stored." The current floods due to monsoon rain in Sindh could not have been prevented by Bhasha dam, but last year's floods could have been by storing the water that deluged large parts of KPK, Punjab and Sindh. Building diversion channels downstream and building dams upstream are not mutually exclusive. Both should be done to smooth out water flows and prevent cycles of flooding and droughts....and produce the much-needed electricity as well. 1- Excessive rainfall, which you've addressed in your mail along with corrective measures. 2- Breaches in the Left Bank Outfall Drain (LBOD) which probably has a bigger impact. LBOD serves the purpose of draining waste water from lower Punjab and northern Sindh (the Seraiki areas) into the Arabian Sea. There is extensive pumping out of subsoil water to reduce salinity in the soil in these regions and all this water drains into the LBOD. Besides, being a drain canal in the originating areas, all surface drains including rainwater drain into LBOD. In southern Sindh the LBOD becomes a dyked canal with the sole purpose of carrying the run off water from the north into the sea. Over the years discharge through LBOD has increased while the dykes are weakened because of lack of maintenance, thus causing this present disaster. To redress this situation, LBOD needs to be expanded and strengthened. Similarly, there is an RBOD serving the same purpose on the other side of the Indus. There were no breaches in RBOD this time but can happen in future affecting Thatta and vicinity. Last year's flooding in Sindh was much bigger than this year because the nearly 30 inches of rain in Sindh was added to by KPK and Punjab rain outflows, which caused the bursts in nearly all dykes. Last year, Tarbela Dam storage never reached more than 80 percent of its designed capacity and there were calls to blast the glaciers on K2 to get more water in. u know this could be one of US weather manipulation weapons being used to create unrest in PAkistan. Scary stuff if they have anything near this capability! Anon: "Too much of a coincidence two mega innundations in 2 years and NOTHING of the sort in next door India amreeka's new best buddy in Asia"
I guess you are unaware of the climate change crisis in India that is increasing rural poverty and driving thousands of farmers to suicide. US manipulates the weather ? If they could do that, they would have done so in China. The United States and Pakistan reviewed progress on ongoing energy programs and recommitted themselves to pursuing practical solutions to Pakistan's energy needs during the latest Pakistan-United States Energy Dialogue this week. Ambassador Carlos Pascual, U.S. Department of State Special Envoy for International Energy Affairs, joined Pakistani Minister of Water and Power Naveed Qamar to reaffirm the partnership. They met September 14-15 in Islamabad. "As all Pakistanis know, reliable and affordable energy is critical to Pakistan's prosperity. Without it, businesses can't operate and families can't light and cool their homes. Pakistan's future depends on power," Ambassador Pascual said at the opening of the Dialogue. "There are no quick fixes to this crisis, but the United States and international partners are willing to help. We will continue to support Pakistan in its efforts to resolve this energy crisis." Ambassador Pascual reaffirmed the United States' long-term commitment to working with Pakistan to establish a commercially-viable and sustainable power sector. During the Dialogue, the U.S. and Pakistan reviewed ongoing cooperation in the energy sector. USAID highlighted its ongoing energy programs, which will bring more than 900 MW of power to the Pakistani grid by 2012. The programs include construction and rehabilitation of three hydropower plants (Satpara, Gomal Zam and Tarbela) and three thermal power plants (Guddu, Muzafargarh, and Jamshoro). This extra energy will bring power to approximately 7 million people, eradicate 20 percent of Pakistan's existing power shortage, reduce annual oil imports by more than one million barrels and help store water for irrigation and flood control. The increases to the energy sector will also bring job opportunities for as many as 2.5 million heads of households. The U.S. delegation welcomed Pakistan's plans, elaborated in the Integrated Energy Sector Recovery Report and Plan, to put the power sector on a commercially-viable and sustainable path. In the Dialogue, Pakistan underscored its commitment to strengthen energy sector governance and efficiency, pursue regulatory reforms, improve financial management, and create a business climate that helps drive investment. Key topics of discussion at the energy dialogue included: an overview of the power sector and challenges it faces; the current policy and regulatory framework, and possible reforms; availability of primary fuels; the role of the private sector; and regional energy initiatives. The U.S. underscored that these measures will help develop a stronger foundation for investment. Both sides agreed to continue technical exchanges in areas that can help improve power availability. The U.S. also welcomed Pakistan's continued engagement with international financial institutions and the private sector to assess feasibility of viable hydropower projects and appreciates its commitment to international environmental and societal standards, while also focusing on the importance of water management. In Pakistan everybody is cutting trees from the forest areas for cooking and heat in cold season because there is no electricity most of the time. Outside of Islamabad area politicians are not doing anything because Taliban is cutting trees without permission to supply the poor people. I think we need trees to prevent flood. Saudi Arabia signed an agreement in Riyadh on Monday with the local chapter of UNICEF to rebuild a massive water supply network in Pakistan devastated by ravaging floods. The move follows an instruction from Crown Prince Naif, deputy prime minister and interior minister, who authorized Saudi officials to finance the repairing and renovation of some 76 potable water networks to ensure a clean and regular water supply to flood-hit families in the country’s Balochistan province. “The cooperation agreement was signed by Saeed A. Al-Harthi, advisor at the Ministry of Interior; and Ibrahim Al-Ziq, UNICEF representative to the GCC,” said a statement released by the ministry. The statement said this support from the Kingdom comes within the framework of the ongoing King Abdullah's Relief Campaign for Pakistani People (KARCPP), which has so far raised more than SR400 million to help people affected by floods in Pakistan. Crown Prince Naif, who is also the KARCPP's general supervisor, has ordered the implementation of the water project, which will cost more than SR6 million. Clean drinking water is not available in flood-hit areas even today because the entire water supply network was destroyed during the floods, said a Pakistani embassy official. “The water safety situation in Balochistan worsened as a result of the flooding and this also resulted in existing water sources being contaminated,” he added. A month of incessant monsoon rains in the provinces of Balochistan and Sindh left at least 7 million people affected and claimed more than 400 lives recently. It was the second year running that disastrous flooding hit Pakistan and many of this year's victims had only just begun to rebuild their lives. Balochistan is one of the five provinces of Pakistan. With an area of 347,190 square kilometers, it is the largest province of Pakistan with about 9 million people and constituting approximately 44 percent of the total landmass of the country. Saudi Arabia has been at the forefront of efforts to help the people of Pakistan. The Kingdom was the largest donor to Pakistan's flood relief effort. As part of the campaign, Saudi citizens and Pakistani expatriates cumulatively raised more than SR80 million in a separate campaign. Saudi Arabia was also the first and the only country to set up two field hospitals to Pakistan to provide medical services for flood victims there. The Kingdom has also contributed about SR60 million to UNICEF to support polio eradication in Niger. The funds will be used to purchase oral polio vaccines and other accessories to allow the government of Niger and its partners to immunize up to 3.77 million children. Further south in a more rural and remote part of Punjab, famed writer and erstwhile lawyer, Daniyal Mueenudin, maintains a mid-size farm which is exemplifying other kinds of innovations. The farm does not boast ecological farming practices, apart from tunnel farming that can help with land conservation and humidity control. However, Daniyal has changed the social landscape of his area through implementing a “living wage” for all his employees. Noting the high level of inequality in Pakistan’s hinterland, the Yale-educated former director of the university’s Lowenstein Human Rights Clinic, is practicing what he preached. He also owns a farm in Wisconsin and could have a comfortable life in the States but his social obligations keep him ensconced in Pakistan for most of the year..
...Raising the wage several-fold for works and farm manager, and also offering bonus incentives for performance, has led to positive competition that can help to erode the feudal levels of income disparity which exist in this part of Pakistan. At the same time, Daniyal is also committed to providing new livelihood paths for the agrarian workers as automation reduces farm employment in some areas. He has has fully funded a school and provided a merit-based scholarship for advanced degrees to students from the nearby village. One of the children from this school (the first in his family to even go to school) is now making his way through medical school in Lahore! “The cost of the project has swelled to over Rs333 billion for which the Planning Commission is evaluating the revised PC-1 of the project which will be given approval by Executive Committee of National Economic Council (Ecnec),” a senior official, who is directly involved in the project, said. “Pakistan needs a credit line at any cost to maintain the ongoing pace of construction of the project, otherwise project would get delayed,” the official added. If the project is not completed on time by 2016, India would find itself in a better position to first complete the Kishan-Ganga hydropower project on the Neelum River in the held Kashmir. Under the Water Treaty, the country which completes the project first on Neelum river will have the first water priority rights. Pakistan is already in a legal battle at the International Court of Arbitration in Hague against India over faulty design of the Indian project. Keeping in view the strategic emergency of the project, the official said, Pakistan needs $704 million and in this regard the government is under dialogue with various donor countries. “China has already committed $483 million loan, but it has delayed the disbursement of the credit line,” the official said and added that the Prime Minister Syed Yousaf Raza Gillani is scheduled to visit Beijing some time this month and top priority of the agenda of the premier is to ensure the credit line from the EXIM Bank of China. Moreover, the Saudi Development Fund has also committed $80 million but authorities are asking them to increase the credit line to up to $230 million, the official said. However, negotiations to this effect between Pakistan and Saudi Arab are underway. The UAE has also committed $100 million. The OPEC Fund has also indicated to extend $31 million which may go up to $80 million. The Water and Power Development Authority (WAPDA) here on Thursday informed the Senate Standing Committee on Water and Power that WAPDA is working on 20,000 megawatts (MW) hydel power generation projects and assured that 10,276 MW at lowest rates will be made available in the country by 2020. The Senate body met in the Parliament House with Senator Zahid Khan in the chair, Minister for Water and Power Chaudhry Ahmed Mukhtar, secretary Zafar Mehmood and Petroleum Secretary Dr Waqar Masood Khan also attended the meeting. The members of the committee questioned that who would be judging the claim of WAPDA in 2020 when no one from the members of this committee will be in the parliament. However, WAPDA officials assured the committee that what they are committed to make sure through their efforts by 2020 that 10,276 MW power through hydel projects would be available in the country. A WAPDA official explained that less than committed financial resources is the main hurdle in delay and cost overrun on water and power sector development projects and sought help of the committee in providing funds to WAPDA as per committed amount to make its planning predictable. WAPDA Chairman Shakeel Durrani was optimistic about the average annual flows and water storage potential of the country and informed that some 17.8 million acres feet (MAF) water would be available for storage in future in the country (enough for three dams like Diamer Bhasha Dam). The live storage of the Diamer Bhasha Dam would be 6.8 MAF and WAPDA has already released Rs 5 billion for land acquisition and Rs 13 billion for construction or establishment of required infrastructure for the construction of dam like roads, residential colony and offices power availability. Explaining the access water availability scenario, he informed that average annual flows to Kotri Downstream were 31.3 MAF during 1976-2010. However, during 2012 alone 54.5 MAF flows to Kotri Downstream were recorded. The unfolding tragedy has grabbed the attention of the national media but aid remains scarce, a day after Prime Minister Nawaz Sharif and Bilawal Bhutto-Zardari, son of the late premier Benazir Bhutto, visited the area. Thar desert, which begins around 300 kilometres (200 miles) east of Karachi and runs up to the border with India, is dominated by subsistence farmers who depend on beans, wheat, and sesame seeds for survival, bartering surplus in exchange for livestock. It has been hit by a rainfall deficit of roughly 30 percent between March 2013 and February this year, according to government data, with the worst-hit towns of Diplo, Chacro and Islamkot barely touched by a drop of water for months. At an army-run camp in Mithi, women dressed in the yellow, red and blue dress typical of the region's Hindu community, waited in a line for relief which many said was hard to come by. "Please get me a food permit, I have been coming here since yesterday but in vain," one woman pleaded. Hindus, a small minority in Pakistan's overwhelmingly Muslim population of 180 million, have been the worst affected by what is happening in Tharparkar. "Of all the children we treated 75 percent were from the Hindu community," said Khatri, the doctor in Mithi. Much of the aid so far has been provided by the charity wing of banned Islamist outfit Jamaat-ud-Dawa, whose head Hafiz Saeed is wanted by India for allegedly masterminding the Mumbai attacks. Hafiz Abdul Rauf, who heads the organisation in the area, said that the primary cause of the deaths was the grinding poverty that has afflicted the area for decades. An outbreak of sheep pox has aggravated the situation, according to residents who depend on livestock as a form of saving, selling an animal when money is needed for a special occasions such as weddings. "We had 300 sheep, (but) because of 'Mata' (sheep pox) and drought, 150 of them died over the past two months," said Bheer Lal, 30, from one of the affected villages. "Our life depends on the livestock and now they have gone our life is at stake." Madan Lal, a senior official with the Sindh livestock department, told AFP that 12 vaccinating teams had been sent out to treat livestock on a "war footing". Sono Khangrani, the head of Thardeep Rural Development Programme, an NGO working in Thar, warned the situation could deteriorate as spring gives way to the hot summer. "Thar will see worse conditions in coming days. Hot weather will increase the drought in April, May and June," he told AFP. "Thar has been facing this problem for years and years but this time the media highlighted the issue and forced the government to respond." The leaders of the University of Utah and Mehran University of Engineering and Technology traded memorandums of agreement Tuesday in the new campus law building, formalizing an academic partnership for water research. Although the signing of a memorandum of agreement does not bind either party by law to uphold agreements made regarding the project, the documents are treated with the highest respect by both institutions. "Utah and Pakistan surely share common ground in this sector. We both cope with water scarcity and the need for better ground management," University of Utah President David Pershing said. The partnership will serve as a model of cooperation, address critical water issues and train the next generation's water professionals, Pershing said. The educational partnership is part of a program known as United States-Pakistan Centers for Advanced Studies in Water and is funded by the United States Agency for International Development. Academic programs resulting from the project will include master's and doctorate degrees in three water disciplines at Mehran University, which provides many opportunities for research and will be the primary center for the project because it's located in the water-stressed Sindh province of Pakistan. According to M. Aslam Uqaili, vice chancellor of Mehran University, the higher education institution received nearly 500 applicants for 50 positions in the upcoming academic water programs. Meanwhile, U. faculty, staff and students will have several research opportunities as they collaborate with Pakistani academics and five other partner institutions, including Colorado State University. "It aligns very well with strategic priorities of our institution," said Ruth Watkins, head of academic affairs at the U.
Watkins said the partnership will help bring in expert faculty to the University of Utah, assist in achieving the school's environmental goals, and increase the presence of women in technology and science. Participating parties are also hoping the pending research will address four overarching water problems in Pakistan: surface and groundwater availability, hazard and risk management, environmental quality, and climate change. "The situation in Pakistan, as far as water scarcity is concerned both for human consumption as well as for agriculture, is something that really does need to be tackled," said Hamid Asghar Khan, consul general of Pakistan in Los Angeles. In some areas of Pakistan, young children die from the lack of proper drinking water, Khan said. Finding water solutions Pakistan is just the beginning. United States Agency for International Development officials are hoping new technology will be applicable to other water-stressed regions throughout the world. The UN’s Food and Agriculture Organisation measures the pressure on national water resources by calculating water withdrawal as a percentage of total renewable water resources (TRWR). Stresses are considered high if the TRWR value is above 25 per cent. Pakistan’s water pressure amounts to a staggering 74pc. This level of pressure is high, even when compared with neighbouring countries, such as Iran at 67pc, India at 40pc, Afghanistan at 31pc, and China at 19.5pc. 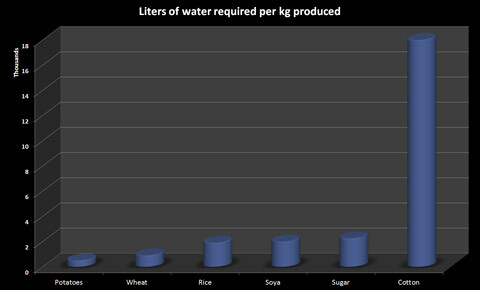 The problem is not only that too much water is not good for the crop but that the water thus wasted is in short supply. Water availability per person in Pakistan today is 1,000 cubic metres, down from 5,600 cubic metres per person in 1947, the year that the country gained independence from Britain. There were about 35 million people in Pakistan in 1947. Today there are nearly 140 million, but water availability has remained the same. "I need water for properly irrigating my fields before tilling the soil for sowing wheat seeds," 35 year-old Ahmed told IRIN in a field in the North West Frontier Province (NWFP) town of Mardan. "The more water I give to the soil, the better it will be," he said. Unless the fallacy of this outdated custom is exposed without delay, the adverse effects resulting from it could cost Pakistan dear. This widespread practice among the farming community is already ringing alarm bells for water experts in Pakistan, still affected by the effects of a three-year drought. "When Pakistan was created, our water resources were the same as they are today - about 138 million acre feet [the volume of water that would cover an area of one acre to the depth of one foot]," Muhammad Akram Kahlown, chairman of Pakistan Council of Research in Water Resources, told IRIN in the Pakistani capital, Islamabad. One solution is the development of reservoirs. At least six new dams are planned to be built over the next 20 years. However, in the short term, the situation of the country's two largest reservoirs is far from satisfactory. "On the average, we have inflows of 146 million acre feet of water in normal years, but for the last three years it is a drought-like situation. Last year, our shortage of water was 25 to 30 percent. During this Rabi [winter crop season] it is about 50 percent short," Riaz Ahmed Khan, chairman of the Federal Flood Commission of Pakistan, told IRIN. "In normal years we use about 35 million acres of water during Rabi, but this year only 18 million is available," he said. Part of the problem was the shortage of water in the Mangla and Tarbela dams, he explained. Mangla Dam's capacity to store water is 1,202 ft, and the dead level is 1,040 ft - the level reached after which water is not withdrawn to avert the silting up of the power tunnels. Tarbela's maximum level is 1,560 ft, and the dead level is 1,369 ft. 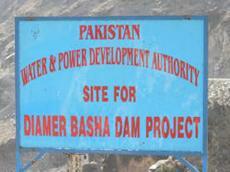 Both the dams are short of water, and if rains are not timely, disaster could befall the country's irrigation network. Experts say Pakistan's vast irrigation network - comprising three main reservoirs, 19 dams, 43 main canals and a conveyance length of 57,000 km - is ageing and highly inefficient. Riaz Ahmed Khan said Pakistan pumps 106 million acre feet of water into the canals. Almost 36 million acre feet are lost to seepage, which in turn causes waterlogging, rendering the land uncultivable. Pakistani officials say that with financial assistance from the World Bank and other multilateral sources the government is working on a drainage project to address this problem within the next few years. Kahlown said 45 million acre feet of water are added to the irrigation system from the ground water available in the country. But during the last three years massive pumping out of ground water had taken place. "If there are no rains soon, we will be in bad shape. In the past, a tube well which used to work for four hours, now pumps water out 20 hours a day," he said, adding that this practice was unsustainable. "Of the 565,000 total tube wells in Pakistan, nearly 70 percent are now pumping hard water or saline water, because sweet water has been exhausted. If the drought persists for a year or so, it will mean that there will be more pressure on these tube wells," he said.